Samsung’s smartphone ascent was breathtaking. From having essentially zero market share in the category in late 2010 to becoming the largest vendor took less than two years. In doing so it grew to become the largest phone vendor, smart or not–a goal which eluded them during the previous decade of effort. Samsung went on to capture not only the lion’s share of unit volumes, they also took almost all the profits in the Android mobile phone market. And in a market filled with competitors. Literally hundreds of vendors and thousands of products were available at every conceivable price point. Samsung did away with HTC, LG, and Motorola. HTC, the first Android vendor (and first to market with Windows Mobile), Motorola, Google’s launch partner in the US and “Droid” brand partner (and future owner). Google’s own Nexus products. Samsung Galaxy ruled them all. Galaxy swamped the Chinese market and the Indian market, the largest in the world. They were so powerful that they were singled out both by Microsoft and Apple for IP royalties. All within two years or the average life-span of one smartphone. But something went wrong in 2014. Growth in shipments suddenly stopped. This was not a problem with the overall market, which kept growing. The slowdown did not affect other vendors, especially the up-and-coming Lenovo and Xiaomi and the second and third tier vendors whose names are known only in the local markets they serve. Note how the wobble in units shipped was foretold by slowing revenues and an even more profound effect in profits. Peak revenues and profit occurred in Q3 2013 while volumes continued to grow until Q1 2014. Even in the last quarter, shipments are at near year-ago levels. Profits however have dropped to 2011 levels. At the same time, Apple shipments continue to grow as do those of Lenovo, Huawei and Xiaomi. Xiaomi in fact is growing in a trajectory eerily parallel to that of Samsung from 2010. It just hit the same level of volume that Samsung had in Q2 2011. And Samsung had been making phones for decades while Xiaomi is barely two years old. Having seen a boom/bust rise/fall pattern with other vendors (e.g. Nokia and Blackberry) it should behoove us to ask what are the causes of success and failure in this business. Samsung management suggests that they perceive speed of action, product mix/portfolio choices and hardware experimentation are the keys to their success. 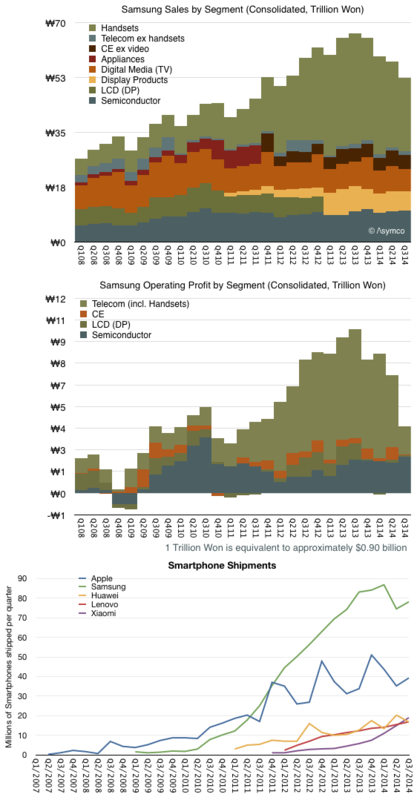 However, competitors which are rising rapidly (at the expense of Samsung) are not acting in the same way. Xiaomi is patterned as a Chinese Apple, offering design, brand, attention to detail and software as differentiation. Lenovo is building on its computing roots and expanding with acquisition. Huawei and ZTE leverage networking business and operator relationships. The crisper answer to causality may be that the market is bifurcating into an “upper” market where new jobs-to-be-done are being explored with integrated offerings (Apple and Xiaomi) and a “lower” market which is in the throes of low-end disruption. Both are competing with non-consumption though the upper market is service non-consumption and the lower market is feature non-consumption. Samsung is stuck right in the middle1 It defines itself on the basis of what exists. It competes only within a defined market and positions itself agains existing products. They claim to be “better” than the competition and make the point loudly with their advertising. However, being better is never a solid foundation. At some point you’ll be either good enough or someone more agile will be faster than you. At some point the fast follower exposes themselves to being faster followed. Better to find new lands to conquer. ‹ Previous Post How many iOS devices will be produced in 2015?